The single surviving page known as the Kringla leaf (Kringlublaðið) is kept in the National and University Library of Iceland. Heimskringla (Icelandic pronunciation: ​[ˈheimsˌkʰriŋla]) is the best known of the Old Norse kings' sagas. It was written in Old Norse in Iceland by the poet and historian Snorri Sturluson (1178/79–1241) c. 1230. The name Heimskringla was first used in the 17th century, derived from the first two words of one of the manuscripts (kringla heimsins, "the circle of the world"). Heimskringla is a collection of sagas about Swedish and Norwegian kings , beginning with the saga of the legendary Swedish dynasty of the Ynglings, followed by accounts of historical Norwegian rulers from Harald Fairhair of the 9th century up to the death of the pretender Eystein Meyla in 1177. The exact sources of his work are disputed, but included earlier kings' sagas, such as Morkinskinna, Fagrskinna and the twelfth century Norwegian synoptic histories and oral traditions, notably many skaldic poems. Snorri had himself visited Norway and Sweden. For events of the mid-12th century, Snorri explicitly names the now-lost work Hryggjarstykki as his source. The composition of the sagas is Snorri's. The name Heimskringla comes from the fact that the first words of the first saga in the compilation (Ynglinga saga) are Kringla heimsins, "the orb of the Earth". The earliest parchment copy of the work is referred to as Kringla, now catalogued as Reykjavík, National Library, Lbs fragm 82. This is now a single vellum leaf from c. 1260; the rest of the manuscript was lost to fire in 1728. Heimskringla consists of several sagas, often thought of as falling into three groups, giving the overall work the character of a triptych. The saga narrates the contests of the kings, the establishment of the kingdom of Norway, Viking expeditions to various European countries, ranging as far afield as Palestine in the saga of Sigurd the Crusader. The stories are told with a life and freshness, giving a picture of human life in all its reality. The saga is a prose epic, relevant to the history not only of Scandinavia but the regions included in the wider medieval Scandinavian diaspora. The first part of the Heimskringla is rooted in Norse mythology; as the collection proceeds, fable and fact intermingle, but the accounts become increasingly historically reliable. The first section tells of the mythological prehistory of the Norwegian royal dynasty, tracing Odin, described here as a mortal man, and his followers from the East, from Asaland and Asgard, its chief city, to their settlement in Scandinavia (more precisely to east-central Sweden, according to Snorri). The subsequent sagas are (with few exceptions) devoted to individual rulers, starting with Halfdan the Black. A version of Óláfs saga helga, about the saint Olaf II of Norway, is the main and central part of the collection: Olaf's 15-year-long reign takes up about one third of the entire work. Thereafter, the saga of Harald Hardrada narrates Harald's expedition to the East, his brilliant exploits in Constantinople, Syria, and Sicily, his skaldic accomplishments, and his battles in England against Harold Godwinson, the son of Godwin, Earl of Wessex, where he fell at the battle Battle of Stamford Bridge in 1066 only a few days before Harold fell at the Battle of Hastings. After presenting a series of other kinds, the saga ends with Magnus V of Norway. Snorri explicitly mentions a few prose sources, now mostly lost in the form that he knew them: Hryggjarstykki ('spine pieces') by Eiríkr Oddsson (covering events 1130-61), Skjǫldunga saga, an unidentified saga about Knútr inn gamli, and a text called Jarlasǫgurnar ('sagas of the jarls', which seems to correspond to the saga now known as Orkneyinga saga). Ágrip af Nóregs konunga sǫgum (copying its account of Harald Fairhair's wife Snæfríðr almost unchanged). Morkinskinna (the main source for the years 1030–1177, which he copied almost verbatim except for removing many of the anecdotal þættir). Possibly Fagrskinna, itself based on Morkinskinna, but the much shorter. His own Separate saga of St Óláfr, which he incorporated bodily into Heimskringla. This text was apparently based primarily on a saga of Olaf from about 1220 by Styrmir Kárason, now mostly lost. Oddr Snorrason's Life of Óláfr Tryggvason, and possibly a Latin life of the same figure by Gunnlaugr Leifsson. Snorri also made extensive use of skaldic verse which he believed to have been composed at the time of the events portrayed and transmitted orally from that time onwards, and clearly made us of other oral accounts, though it is uncertain to what extent. Up until the mid-19th century, historians put great trust in the factual truth of Snorri's narrative, as well as other old Norse sagas. In the early 20th century, this trust was largely abandoned with the advent of saga criticism, pioneered by Curt and Lauritz Weibull. These historians pointed out that Snorri's work had been written several centuries after most of the events it describes. In Norway, the historian Edvard Bull famously proclaimed that "we have to give up all illusions that Snorri's mighty epic bears any deeper resemblance to what actually happened" in the time it describes. A school of historians has come to believe that the motives Snorri and the other saga writers give to their characters owe more to conditions in the 13th century than in earlier times. Heimskringla has, however, continued to be used as a historical source, though with more caution. It is not common to believe in the detailed accuracy of the historical narrative and historians tend to see little to no historical truth behind the first few sagas, however, they are still seen by many as a valuable source of knowledge about the society and politics of medieval Norway. The factual content of the work tends to be deemed more credible where it discusses more recent times, as the distance in time between the events described and the composition of the saga was shorter, allowing traditions to be retained in a largely accurate form, and because in the twelfth century the first contemporary written sources begin to emerge in Norway. Whereas prior to Heimskringla there seems to have been a diversity of efforts to write histories of kings, Snorri's Heimskringla seems thereafter to have been the basis for Icelandic writing about Scandinavian kings, and was expanded by scribes rather than entirely revised. Flateyjarbók, from the end of the fourteenth century, is the most extreme example of expansion, interweaving Snorri's text with many þættir and other whole sagas, prominently Orkneyinga saga, Færeyinga saga, and Fóstbrœðra saga. The text is also referenced in Journey to the Center of the Earth by Jules Verne; the work is the one Professor Liedenbrock finds Arne Saknussem's note in. By the mid-16th century, the Old Norse language was unintelligible to Norwegian, Swedish or Danish readers. At that time several translations of extracts were made in Norway into the Danish language, which was the literary language of Norway at the time. The first complete translation was made around 1600 by Peder Claussøn Friis, and printed in 1633. This was based on a manuscript known as Jofraskinna. Subsequently, the Stockholm manuscript was translated into Swedish and Latin by Johan Peringskiöld (by order of Charles XI) and published in 1697 at Stockholm under the title Heimskringla, which is the first known use of the name. This edition also included the first printing of the text in Old Norse. A new Danish translation with the text in Old Norse and a Latin translation came out in 1777–83 (by order of Frederick VI as crown prince). An English translation by Samuel Laing was finally published in 1844, with a second edition in 1889. Other English translations followed. In the 19th century, as Norway was achieving independence after centuries of union with Denmark and Sweden, the stories of the independent Norwegian medieval kingdom won great popularity in Norway. Heimskringla, although written by an Icelander, became an important national symbol for Norway during the period of romantic nationalism. In 1900, the Norwegian parliament, the Storting, subsidized the publication of new translations of Heimskringla into both Norwegian written forms, landsmål and riksmål, "in order that the work may achieve wide distribution at a low price". Snorri Sturluson, Heimskringla, ed. by Bjarni Aðalbjarnarson, Íslenzk fornrit, 26–28, 3 vols (Reykjavík: Hið Íslenzka Fornritafélag, 1941–51). The most recent English translation of Heimskringla is by Alison Finlay and Anthony Faulkes and is available open-access. Snorri Sturluson, The Heimskringla: Or, Chronicle of the Kings of Norway, trans. by Samuel Laing (London: Longman, Brown, Green, and Longmans, 1844), HTML (repr. Everyman's Library, 717, 722, 847). The Saga Library: Done into English out of the Icelandic, trans. by William Morris and Eiríkr Magnússon, 6 vols (London: Quaritch, 1891-1905), vols 3-6. Snorri Sturluson, Heimskringla: Sagas of the Norse Kings, trans. by Samuel Laing, part 1 rev. by Jaqueline Simpson, part 2 rev. by Peter Foote, Everyman's Library, 717, 722, 847 (London: Dent; New York: Dutton, 1961). Snorri Sturluson, Heimskringla: History of the Kings of Norway, trans. by Lee M. Hollander (Austin: Published for the American-Scandinavian Foundation by the University of Texas Press, 1964). 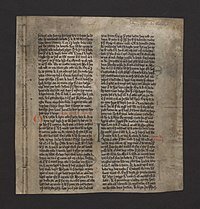 Snorri Sturluson, Histoire des rois de Norvège, première partie: des origines mythiques de la dynastie à la bataille de Svold, trans. by François-Xavier Dillmann (Paris: Gallimard, 2000). Snorri Sturluson, Heimskringla, trans. by Alison Finlay and Anthony Faulkes, 3 vols (London: Viking Society for Northern Research, 2011-15) (second edition 2016-), vol 1 (1st edn); vol 1 (2nd edn); vol 2; vol. 3. Monsen, Erling (1990). "Introduction to the Translation of Snorre's History of the Norse Kings". Heimskringla or the Lives of the Norse Kings: Edited with notes by Erling Monsen and translated into English with the assistance of A.H. Smith. Mineola, New York: Dover Publications, Inc. ISBN 978-0-486-26366-3. . A reprint of the 1932 Cambridge edition by W. Heffer. Bagge, Sverre (1991). Society and Politics in Snorri Sturlusons Heimskringla. Berkeley, California: University of California Press. ISBN 0-520-06887-4. ^ Geir T. Zoëga, A Concise Dictionary of Old Icelandic (Oxford: Clarendon, 1910), s.vv. kringla, "disk, circle, orb" and heimr. ^ Snorri Sturluson, Heimskringla, trans. by Alison Finlay and Anthony Faulkes, 3 vols (London: Viking Society for Northern Research, 2011-15) (second edition 2016-), vol 1 (2nd edn) (p. vii). ^ Snorri Sturluson, Heimskringla, trans. by Alison Finlay and Anthony Faulkes, 3 vols (London: Viking Society for Northern Research, 2011-15) (second edition 2016-), vol 1 (2nd edn) (p. xi). ^ Snorri Sturluson, Heimskringla, trans. by Alison Finlay and Anthony Faulkes, 3 vols (London: Viking Society for Northern Research, 2011-15) (second edition 2016-), vol 1 (2nd edn) (pp. xii-xiii). ^ Snorri Sturluson, Heimskringla, trans. by Alison Finlay and Anthony Faulkes, 3 vols (London: Viking Society for Northern Research, 2011-15) (second edition 2016-), vol 1 (2nd edn) (pp. ix-xi). ^ e.g. Sverre Bagge, Society and Politics in Snorri Sturlusons Heimskringla (Berkeley, 1991). ^ Snorri Sturluson, Heimskringla, trans. by Alison Finlay and Anthony Faulkes, 3 vols (London: Viking Society for Northern Research, 2011-15) (second edition 2016-), vol 1 (2nd edn) (p. xiii). ^ "forat verket ved en lav pris kan faa almindelig udbredelse". Snorre Sturlason, Kongesagaer (Kristiania, 1900). Wikimedia Commons has media related to Heimskringla.